Let me cut to the chase. 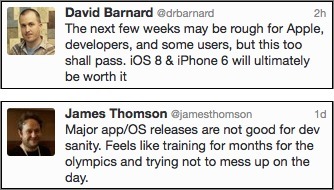 With iOS 8 now out, vast numbers of developers will be releasing updates to their apps. If you have automatic app updates enabled for your iPad, iPhone, or iPod touch, I recommend you turn that feature off until things settle down in a few weeks. 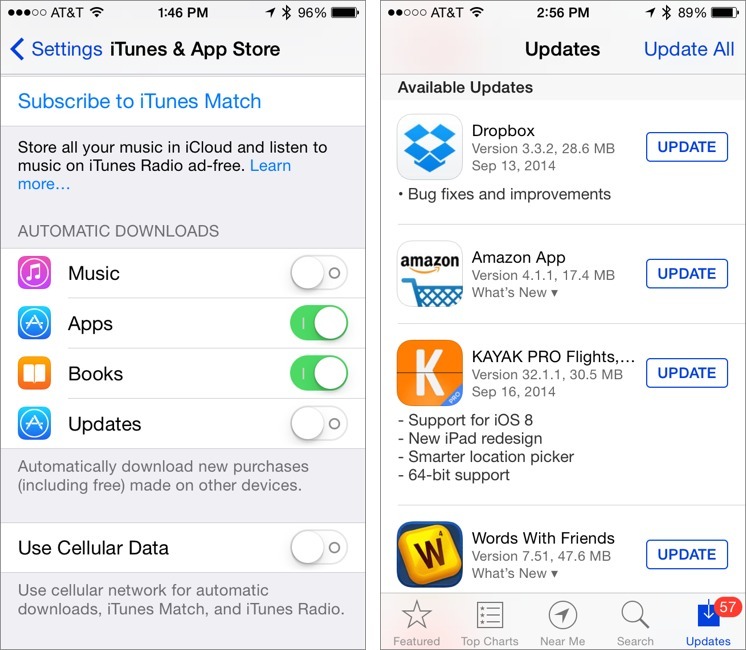 To do so, navigate to Settings > iTunes & App Store and make sure the Updates switch is off. To get specific app updates when you’re ready, go to App Store > Updates, and tap the Update button for each app you want to download after checking the release notes. This is more work, but it lets you update your essential apps at a time when potential problems won’t be crippling and when you won’t use up valuable cellular data unnecessarily. The overarching problem here is that a major operating system update is a moving target, with Apple changing how features work while developers attempt to code for them. You can get a sense of how frustrating this can be in Bryan Irace’s blog post outlining all the problems his team had building a share extension for the Tumblr app. Developer Craig Hockenberry put it best, noting that the only way to guarantee an app works is to put it into a production environment, something that’s not possible until Apple has both released iOS 8.0 and flipped the increasingly large number of switches behind the scenes to ensure that all the iCloud-based services are enabled. To an extent, Hockenberry’s dictum has always been true, since no amount of testing can anticipate every real world usage scenario. But with iOS, making an app requires a constant dance between developers and Apple, making that production environment increasingly hard to simulate in advance. I do all my updates via iTunes on my iMac. I can then choose in what order I download them to iTunes, usually from the smallest file size to the largest. I've also disabled automatic install of apps in iTunes for each of my iDevices. Automatic updates all the way. I see no reason not to. "With iOS 8 coming out on Wednesday, 16 September 2014"
Tuesday the 16th? Or Wednesday the 17th? BTW I always have auto-update off and read the descriptions; I feel everyone should always do that. While I understand people's desire to simplify things by using automatic updates, it's really foolish to do it when you can't easily undo the update. If a Mac app auto-updates and breaks, I can go back into my archives and reinstall the prior version. Doing the same thing on iOS is possible, but only if you update through iTunes, and only by a non-intuitive series of actions. And if the update is the OS itself, you have to almost jailbreak the device to roll it back. As long as updates are not easily reversible, it is foolish to use auto-update. It is an idea whose time has not yet come. Actually you can update an app directly to your iPhone and still reinstall a previous version, IF you sync your phone to iTunes. When iTunes gets a newer version by whatever means, it dumps the older one in the trash. Instead of emptying the trash, move the old app versions into an appropriately named folder elsewhere on the storage device. Then to reinstall, simply double click on the app from this folder you want to install, and then sync to your iPhone and delete the newer app. It might seem like a good idea to delete the newer app from your iPhone first except that if it has any data attached, that data will also be deleted. Of course I can't guarantee this will work with every app, but it has worked with the few I've tried.